For The Ravens, who struck big with Write Me A Letter last fall, then saw their previous release Ol’ Man River from last spring get dragged onto the charts in the wake of that as 1948 dawned, there hadn’t been much time between those two events to do much testing out of the waters. Their breakthrough came so soon before the recording ban went into effect (in fact, it didn’t officially chart until the first week in 1948, a few days AFTER studio doors were effectively shuttered) that they needed to at least have one potential ace up their sleeve if all else failed. So they took a short cut and churned out a sequel. Now most of the time sequels are a rather uninspired choice to make. It usually shows all involved don’t have the confidence in their ability to craft something entirely new and appeal to the public on a fresh song’s own merits and as we’ll see over time here most of those efforts will fail, both artistically and commercially. But considering the unique circumstances as 1947 wound down we can grant them a bit more leeway. Of course, most sequels – to take full advantage of its predecessor’s recognition – leave a lot less doubt that the record in question IS a sequel by naming it something dreadfully obvious and unimaginative. What’s the use of treading the same ground if you do so under cover of darkness? But The Ravens choose to leave out the two most identifiable words from the original source, “write” and “letter”, and don’t replace them with any other form of communication, such as telegram, postcard or “Drop me a line!”. I suppose that’s either commendable or shortsighted, if not both, but as it turns out it had no effect on its commercial prospects. In fact, the sequel performed almost exactly the same commercially as Write Me A Letter had. The original charted for 11 weeks, topping out at number five, while Send For Me If You Need Me also reached number five, staying one week longer on those charts in the process. It needs to be noted though, and this is the perfect place to do so, that in the second week of June, just after this was released, Billboard magazine expanded the Race Charts, as they were still known, from ten spots to fifteen, showing that the increasing popularity of this music and the growing economic power of the black music consumer was gaining notice. No doubt that had a little something to do with Send For Me’s… time on those listings, but a hit is a hit and while it may have not been quite as appealing to the audience, it wasn’t far off. But as to whether it was as good as their first hit, that’s another story. As with many sequels there’s not much deviation from formula in the second installment. Every pair of ears will be comparing it to what they presumably already know and like. Therefore the bar for enjoyment will be set a little higher as the second song will never be judged entirely on its own merits, but rather will be measured against the listener’s enjoyment of something else that preceded it. That’s a tough thing to overcome. Making it even tougher is the simple fact that the writers and performers need to determine how closely to follow the outline of what they’d already laid out and walk a tightrope to ensure they don’t fall too far on either side of the equation. A mere imitation scarcely qualifies as a “new” record and very easily can draw scorn and outright dismissal for not giving the record buyer something fresh. Yet the farther away you stray from the successful blueprint of the first the less bankability it’s believed to have AS a sequel, which means you probably should’ve just done something completely original instead. On Send For Me If You Need Me The Ravens stick pretty close to what they’d done so well in the fall and frankly that’s its problem. Both records begin with an insistent piano. In the original it was just a little more crude, which provided a nice transition to the smooth vocal harmonies that followed. Here they add a little more flourish to it while retaining the hammering intro and it comes off as a bit stale. It’s one thing to model a song on a previous effort, but it’s another thing altogether to barely deviate from its every nuance, or to slightly water it down for broader consumption perhaps. Had they used a guitar to play the same notes instead, or took advantage of the snare drum to deliver the same TYPE of thudding lead in but with a different sound palette it’d have worked better. But if you knew Write Me A Letter and had listened to it a lot, as was surely the case for most of the intended audience, you’d feel a strong sense of déjà vu from the very first notes and that doesn’t bode well as your skepticism meter starts to jump into the danger zone. They DO alter the structure noticeably after that however, but unfortunately their reasons for doing so seem less to do with offering some new variant to help the song achieve an entirely different mood and more to do with (over) relying on their most obvious selling point, namely the wonderful bass voice of Jimmy Ricks. To do this they dispense with the wonderful group harmony lead in that kicked off “Letter” so well and just have Ricks jump right in with the first verse, picking up the story precisely where the other left off, leaving no doubt as to the connection by saying “Yes I finally got a letter and this is what my baby had to say”. Obviously there’s never been any question that Ricks was the undisputed star of the group, the drawing card and the immediate identifying marker to let one and all know this was a Ravens record as soon as his subterranean bass voice rumbled out of the speakers. It’s understandable the folks at National Records would want to waste as little time as possible before headlining that fact here. But the voice alone, as brilliant, expressive and resonant as it is, works best in contrast to the sweet blend of the others. Whenever he comes in following impeccable group vocals the difference is startling, grabbing you and forcing you to pay attention. 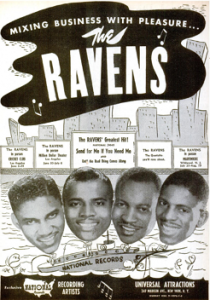 Few vocal groups, no matter how dynamic their lead singer may have been, had the kind of built-in suspense that had listeners anticipating their first utterance the way The Ravens did with Ricks. But Superman’s arrival isn’t nearly as dramatic if you don’t see more of Clark Kent first. So here, when he bursts from the phone booth already in his cape as the opening credits role, there’s no build-up, no tension, no anticipation. It’s akin to a climax with no foreplay. Making matters worse is the fact the rest of The Ravens are left with nothing to do but offer uninspiring and barely audible wordless backing throughout much of it, which may not be as big of a deal if the song was more cleverly written, but what Ricks is singing – that of his girl telling him via letter that she was coming home and his excitement at the news – is rather mundane. The entire arrangement just comes off as a way to inject more Ricks into the song without advancing the plot in any way and in doing so they make the rest of the group almost incidental on their own record. All this for nothing more than a needless recap of past events to remind everyone about what already happened in a better record! That’s not to say it doesn’t have SOME positive attributes going for it. When The Ravens do get a chance to chime in, finishing Ricks’ thoughts when they croon the title line and later providing the full bridge, sans Jimmy, the song comes alive a little more. When they all join in to close it out and Ricks’s impressive voice takes the bottom of the harmony the effect is as good as ever. But those moments are intentionally kept to a minimum and as vocal records tend to have lyrics most in the audience are certainly paying attention to what is being sung and expect something that is well-written and interesting thematically, especially since this is counting on the fact the song it stems from was both of those things which presumably accounted for a lot of its appeal. Yet this fails in that regard and does so with rather shallow aims no less. The biggest problem is it makes no attempt at being creative, content instead to be merely serviceable and since the plot itself certainly didn’t advance our appreciation of this affair any we’re left with simply an urge to go back and play the far better original chapter of this story and throw this sequel on the retread pile. Maybe I’m being a bit harsh on the guys. Send For Me If You Need Me is definitely not a bad song by any means, it SOUNDS fine in passing, the individual performances are all good, even if some aren’t given enough of a role to play, and if you don’t pay strict attention to the storyline particulars you may wind up enjoying it a bit more than I did. But the lack of imagination in its construction drag it down considerably from an objective analytical standpoint, which is kind of what we do here after all. Of course that decision didn’t matter much at the time, audiences were still enamored with the group and it’d been a few months since they’d heard Write Me A Letter regularly so they were more open to revisiting it. 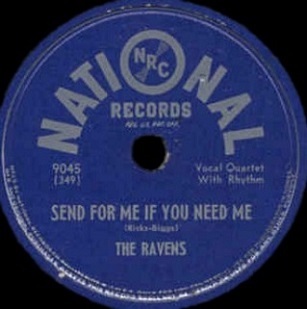 Perhaps most importantly to its appeal is the fact the vocal group idiom within rock itself was still largely a barren field outside of The Ravens making this record seem like a breath of fresh air amidst honking sax-led instrumentals and dashing solo singers that were so prevalent in the spring and early summer of 1948. That would soon change of course as Ravens descendants began appearing on the near horizon, but at this point, when their latest release was still the only way to hear this specific brand of rock music I can definitely understand why it did so well and won’t begrudge them a hit that was basically mailed in. But it’s hard to overlook the fact that this brings nothing new to the table, doesn’t improve upon the recipe of the first offering, and in order to emphasize their most compelling individual feature they take away too much of the group approach that made earlier Ravens songs so good in the first place. Big seller or not, it’s simply not as good of a song – written, produced or arranged – as the record that kick-started The Ravens hit-making careers and so I don’t think it should come as any surprise that my assessment of it differs from history’s somewhat. I won’t hold it against them forever. Leave a reply on "The Ravens: “Send For Me If You Need Me”"